As we age, the gradual breakdown of collagen and elastin fibers causes skin to sag and leaves unsightly wrinkles on our once-flawless complexion. 7Q Spa’s new PDO Thread Lift treatment reverses the effects of aging by rejuvenating and rebuilding the structure of one’s face, essentially reinforcing facial tissues from the inside to create noticeably tighter, more healthy-looking skin. 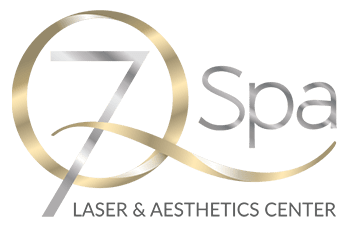 For more information on this revolutionary new skin tightening treatment method can help recapture your youthful appearance, schedule a free consultation with 7Q Spa in Glendale now! Using ultra-fine, synthetic, Polydioxanone (PDO) monofilament thread, 7Q Spa’s PDO Thread Lift treatment can achieve skin tightening results similar to traditional face lifts or Botox® treatments without surgery or muscle-paralyzing injections. By relaxing the facial tendons and stimulating the production of revitalizing collagen, elastin, and hyaluronic acid, the soluble PDO threads acts as a “scaffolding” for the skin, holding wrinkles and folds up against the effects of gravity. Different thicknesses and types of threads are used, depending on the area to be treated, and each thread is introduced (via a very fine needle) into either the subcutaneous fat, the muscle, or the skin itself. Threads usually dissolve completely within 180-240 days, though the revitalizing effects can last for up to two years after the initial treatment. 7Q Spa’s PDO Thread Lift procedure typically takes between 30 minutes to one hour, depending on the treatment area and size, and a local anesthetic cream is typically applied to eliminate any discomfort. The lifting effects of the treatment are noticeable immediately following the procedure, though more permanent results can be seen in 10-14 days and continue for up to two years. Mild swelling is common in the first few days, and 7Q Spa’s experts caution against putting direct pressure on the treatment area or performing excessive facial movements like chewing, talking, yawning, smiling, or drinking from a straw during the three-week recovery period. Though downtime may be longer than other skin tightening procedures or injections, most clients need only one PDO Thread Lift treatment to achieve desired results.